Skot Fred's TTY INTERFACE 1.51b now available! "In excess of 800 feet"
"In excess of 30 knots (submerged)"
SSN 725's keel was laid September 16, 1984 at General Dynamics Corporation, Electric Boat Division, Groton, Connecticut. She was launched June 28, 1986 and commissioned USS HELENA on July 11, 1987. The ship completed a rigorous shakedown schedule following commissioning, then returned to Electric Boat shipyard on January 5, 1988 for a seven month Post Shakedown Availability (PSA). PSA was completed in August 1988 and the ship left Groton bound for Pearl Harbor, Hawaii. USS HELENA passed through the Panama Canal September 15, 1988 and chopped to the Pacific Fleet four days later. HELENA has operated from Pearl Harbor between 1988 and 1998, rapidly acquiring the reputation of a front line attack submarine. The ship completed a Northern Pacific operation in May 1989, and a six month deployment to the Western Pacific in March 1990. HELENA participated in RIMPAC 90 and conducted an Operational Test Launch of several Tomahawk missiles. The ship completed two back-to-back Northern Pacific Operations and MK50 Advanced Lightweight Torpedo Testing during the first half of 1991. HELENA conducted her second Western Pacific deployment in August 1992, finalizing the year with an Eastern Pacific deployment. During early 1993, in preparation for her third Western Pacific deployment, HELENA was the first submarine to serve direct support of an Amphibious Readiness Group's deployment certification. The ship deployed in October 1993 as a member of the Independence Battle Group operating in the Western Pacific, Indian Ocean and Arabian Gulf before returning in April 1994. Since May, HELENA has participated in RIMPAC 94, Prospective Commanding Officer operations and completed her second Selected Restricted Availability. 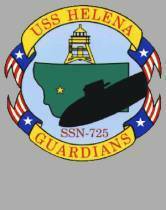 USS HELENA was named the top submarine in Squadron SEVEN for 1994, and was awarded the Battle Efficiency "E". Other ship's awards include the CINCPACFLT Golden Anchor, the Engineering Excellence "E", the Tactical Operations Excellence "T" (two awards) and the Supply Excellence Blue "E" award. On January 6, 1998, Helena deployed to Portsmouth for an anticipated 12-18 month ($110 million) shipyard overhaul and modernization after which she will be homeported in San Diego, CA. 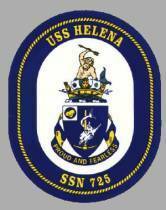 USS HELENA is a deployable asset of the United States Pacific Fleet and is often deployed from its homeport for extended periods of time.